Probably more than any other country, Belgium holds particular prominence to folks around the world who enjoy beer. This young (1830) small (11 million people) country has centuries of brewing traditions built into its history. Belgium’s brewing tradition goes back well over a thousand years. In 1822 Joos Frans Lindemans married a desirable farmer’s daughter called Françoise Josine Vandersmissen. And so the Lindemans family came to own a farm called, Hof ter Wegen. There was farming blood in Joos Frans’ veins, but his sights were set somewhat higher. He was soon mayor of the small town of Vlezenbeek and in the evening, after ploughing his lands, Joos Frans took to brewing lambic (lambiek) beer. During the winter months work would come to a standstill on his 75 hectares of farmland and meadows, and the farm hands, male and female, would be employed in the brewery. What started off as a side activity gradually developed into the main business. Several generations later, by the 1950s, brewing was the sole activity at Hof ter Kwade Wegen. Today, Peaks and Pints presents a flight of Lindemans that we call Craft Beer Crosscut 3.29.19: A Flight of Lindemans. Indigenous to the Senne Valley of Belgium, lambics stem from a farmhouse brewing tradition several hundred years old. These brews are spontaneously fermented — meaning pots containing the wort are left outside and uncovered, allowing whatever critters happen to be flying by on a passing breeze to ferment the beer. These wild yeast give lambics their distinct tartness. Most Belgian brewers also utilize aged hops, which add antibacterial properties to the beer, rather than bitterness or flavor. 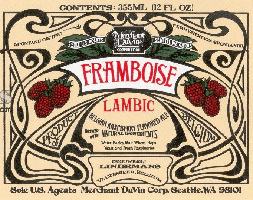 In the case of fruit lambics, whole fruits are traditionally added after halfway through fermentation to add sweetness and new dimensions of flavor. Lindemans Framboise is quintessential lambic. It’s the one people tend to know about — and with good reason. It’s delicious. There is a sugary sweet here that overpowers the inherit sourness of a good lambic. Sounds like a bad thing, right? Put it in your mouth and see if you feel the same way. Lindemans Peche lambic smells like peach cobbler. We braced for that bubblegum-like flavor of many fruit-infused beers, but instead are greeted with a sugary, sweet peach flavor that races happily through our mouth on soft, bubbly carbonation. A quiet tart note in the finish keeps the beer from becoming too cloying. 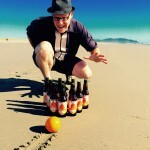 It’s a simple treat that’s easy to drink, especially if you love fruit beers. Lambics are sharp, acidic, and fruity. They can be compared to yogurt or vinegar but with hints of sweetness. There are also several sub-styles of lambics. Lindemans was the first to introduce lambics to the American market (in 1979) and have remained the most popular brand. While they also make a peach, raspberry and pear lambic, the cherry is their most traditional flavor. Whole fresh cherries are added to the casks, triggering a third fermentation and promoting a spritz-y carbonation that gives the finished beer a champagne-like character with excellent mouthfeel. The flavor is akin to a natural black cherry soda, having a dark sweetness with only a flash of malty bitterness. Lindemans Strawberry is the brewery’s most recent new fruited lambic. Choosing strawberry, one of the most noble of fruits, was easy: the complex sweetness of the fruit matches perfectly with the sourness of lambic, resulting in a unique balanced marriage of sweet and sour. The recipe was developed specifically for the ever-developing tastes in the US market. It sports a rosy hue, with a aroma of ripened strawberries. Shows complex, captivating flavors; delicate sweetness is balanced by traditional lambic tartness in the finish. A brewery both traditional and innovative, Lindemans created a new beer category with their Botanical Lambic series: wild-fermented lambic beers, with a new ingredient that leads to an entirely new flavor sensation. Third in this series, GingerGueuze is based on a blend of 12 month-old lambic with two- to three-year-old lambic, fermented in oak with fresh ginger. Bottle-conditioned, GingerGueuze has a golden color and combines the sourness of lambic with the subtle flavors of fresh ginger, herbal Brett, hay, and wood, as well as farmyard and wooden barrel notes.